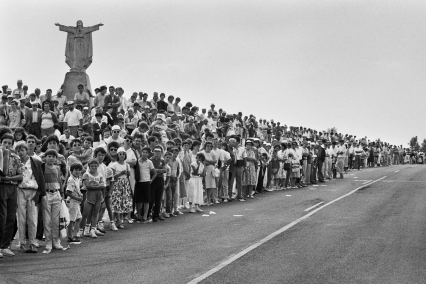 While France has its eyes set on the Great Loop, Polka Galerie will be showcasing Sebastião Salgado’s photographs of the Tour de France over the whole month of July. Since the beginning of his career as a photographer, Sebastião Salgado has gone to every corner of the planet to document men and their labor, and more generally the planet Earth. Surprisingly, this passionate of long-run photo reporting, arid deserts and snowy mountains accepted Liberation’s request to shoot the event in 1986, whereas he had just begun his series “Workers: Archaeology of the Industrial Age”. For the media coverage of the Tour, the French daily newspaper asked him to take photographs of the racers as well as the audience, which had him stop at each of the Tour’s stage villages. Though unusual in the artist’s career, the series shows Salgado’s obsession for Men and their environment. “I already loved France. But after this Tour, I loved it even more”, he confesses. That is how, from July 4th to July 27th 1986, the Brazilian photographer followed each stage of this famous French event. Assisted by Pierre Briançon, Gilles Millet and Jean Hatzfeld, Sebastião Salgado once again stood out for the authenticity of his photographic vision. “His innocence made him capture things on camera that we simply did not see”, says Patrick Le Roux, a journalist for Liberation. Polka Galerie will showcase eighteen of Sebastião Salgado’s pictures from July 2nd to July 30th.